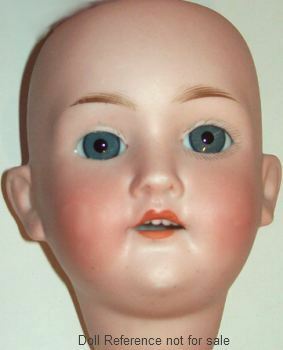 Robert Carl Dolly Face doll, bisque socket head, sleep eyes, painted eyelashes, open mouth with teeth, probably came on a ball jointed composition body, doll mark below. The Robert Carl doll company of Köppelsdorf, Thüringia, Germany made bisque, wax-cloth, cloth or celluloid head character, Mama or baby dolls, some with voice boxes in the heads. Mr. Carl also purchased bisque head doll molds 370 and 390 from the nearby porcelain factory of Armand Marseille and from Edmund U. Steiner. 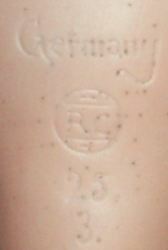 Robert Carl used the doll mark Germany RC inside a circle, with a line above and below the initials, not to be confused with the French company of Radiguet & Condonnier who made fashion Lady dolls marked Déposé R C in the 1880s. In 1913 Robert Carl purchased Mengersgereuth Porzellanfabrik located near Sonneberg. along with son-in-law Gustav Heubach. Mr. Robert Carl passed away in 1936.